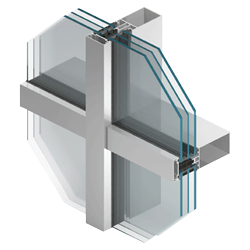 The shape of mullions and transoms allows for erecting aesthetic façades with visible narrow division lines, ensuring at the same time durability and strength of the structure. Rounded profiles of the radius of 2.5 mm, characteristic of the MB-SR50 system, have been replaced in the MB-SR50N system by “sharp edge”. This change essentially influences the aesthetic aspect of the structure. The applied shape of profiles enables selection of mullion and transom profiles which flush with each other on the inside surface of the façade. When the structure is glazed, visually it forms a truss. It facilitates at the same time aesthetic and very accurate connection with other elements of the development – with internal walls and suspended ceilings.